I love spring! I love seeing the birds come back and I love the blossoming trees. Up here we have flowering crab apple trees, and they are absolutely gorgeous. They have beautiful pink blossoms and they smell amazing! Those trees were my inspiration for this cute lunch. I also incorporated a new veggie into this lunch—candy beets. They are so pretty when you cut them, and made beautiful little blossoms for my tree. My kids can be a little picky when it comes to vegetables, and I only have a handful that I can count on them eating every time. I was pleasantly surprised when they actually ate these candy beets, (well, most of them anyway). I think cutting it into a flower shape certainly didn’t hurt. Here’s how to make this lunch at home for your kiddos. 1. Using your bird-shaped cookie cutter, cut your bread into the bird shape. Fill with sandwich filling of your choice and place your birdie sandwich on the plate. 2. Using your knife, cut your carrot into the following pieces: you will need several thin slices for the sun, a small triangle for the beak, a heart shape for the wing, and 2 birdie feet. Place all these carrots on your plate. 3. Take your navel orange slice and place it on top of your thin carrot slices to complete the sun. 4. Put an icing eye on your birdie. If you don’t have icing eyes, you can use a raisin, a blueberry, etc. 5. 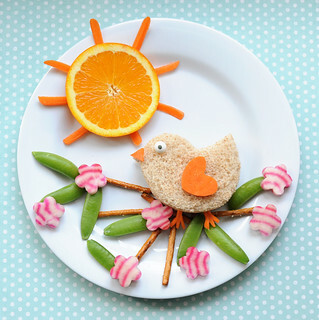 Take your pretzel sticks and arrange them as tree branches underneath your birdie sandwich. 6. Grab your pea pods and place them around your pretzel branches for tree leaves. 7. Take your small flower cookie cutter and your candy beet slices into flower shapes. Place these small flowers around your pretzel branches and pea pod leaves to make beautiful blossoms. So pretty, your kids will want to gobble it right up! Enjoy!